That is where we get the word times for the multiplication symbol, though I also teach my students to use the word of, especially when multiplying with fractions or percents. If the scientist sets the scale factor at 1.0, that will leave the item exactly the same size. Any number greater than one will make it grow, while a number less than one will shrink it. The ray gun has another setting in addition to the scale factor. This setting controls the type of growth or shrinkage. The scientist can make something grow by resizing (changing the size) or by replication (copying). With his Resize setting, he can turn a cockroach into a monster 351⅞ times its original size. Then he can switch to the Replicate setting, which creates multiple copies of the monster, until he has a whole army of giant cockroaches ready to attack. 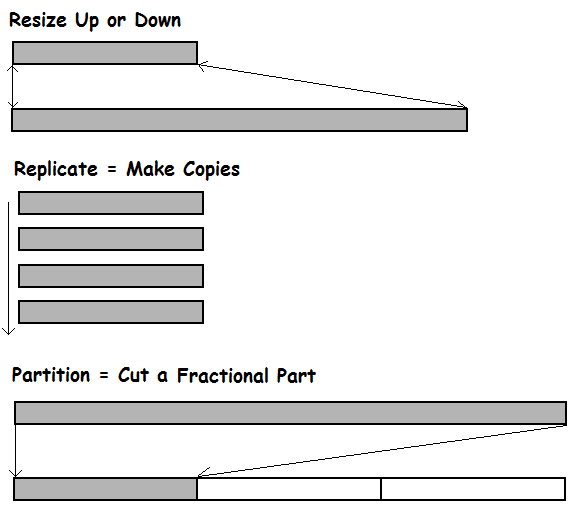 Similarly, the mad scientist can shrink things by resizing or by partitioning (cutting it down to a fractional part). The Resize setting may be used with any scale factor, but the Replicate setting needs a whole number scale factor (how many copies), and the Partition setting needs a simple fraction or percent scale factor. To see what multiplication looks like in real life, explore the multitude of Multiplication Models collected at the Natural Math website. Also available as a poster for easy reference.